Wisconsin is well-known for its solid predator fishing, and muskies get almost all the attention. 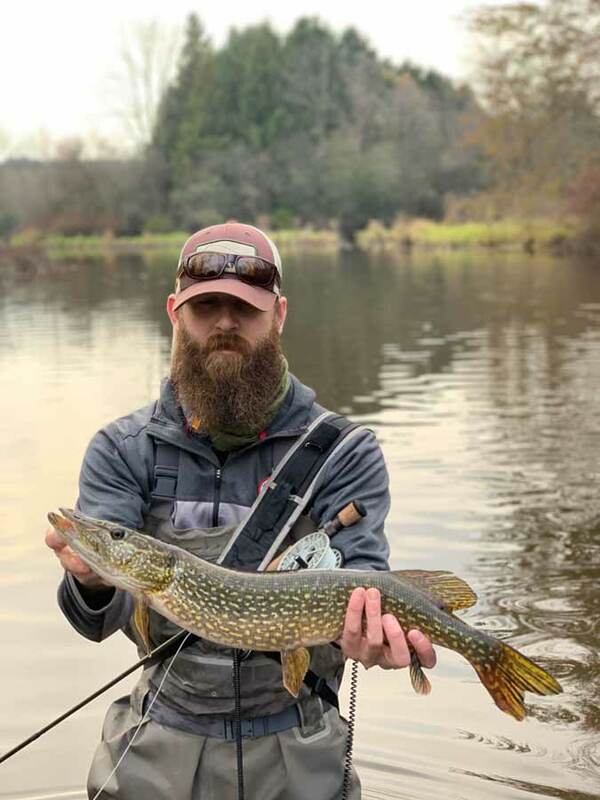 However, there’s another member of the Esox genus that’s significantly more abundant and, some would say just as fun, that you can fish for year round: northern pike. Any fish named after a pole weapon must be pretty mean, right? 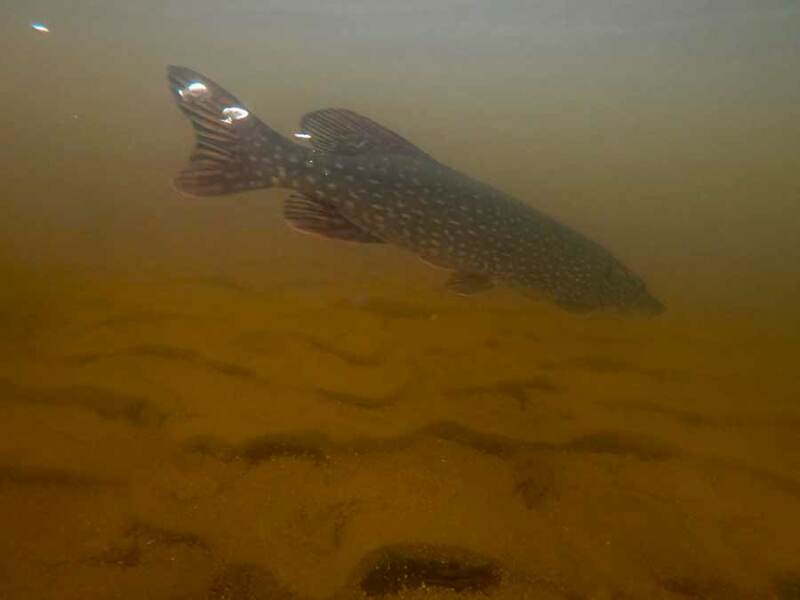 Plus, Wisconsin pike can grow to upwards of 40 inches and 20 pounds! The aggressive nature of these fish make the sport visually thrilling. Orvis Milwaukee Fishing Manager John Klinzing suggested my friend Ed and I meet him north of the city at an undisclosed river to chase a few of these monsters. We layered up against some light rains in the morning and fished into the afternoon under the clouds. The first northern charged hard at my streamer and smashed it. Immediately, I lifted my rod to set the hook, pulling the streamer out of the fish’s mouth. John and Ed looked at me with disgust and gently reminded me that these fish are not trout. A hard strip set is the only way to hook a pike. 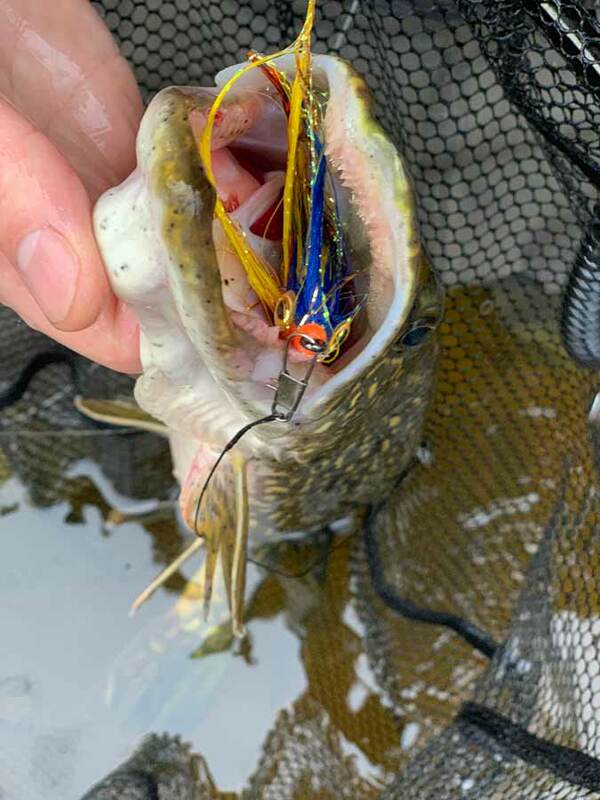 After one more failed attempt–this time I didn’t set hard enough–I landed my first river pike on a fly. It was an absolutely exhilarating experience! The arsenal of flies included large streamers in lots of gaudy colors. Pike have bony mouths, so you need to make a hard strip set, with the rod tip down, to drive the hook home. If you don’t set hard, you will miss your opportunity, and the fish likely won’t come come back for a second try. 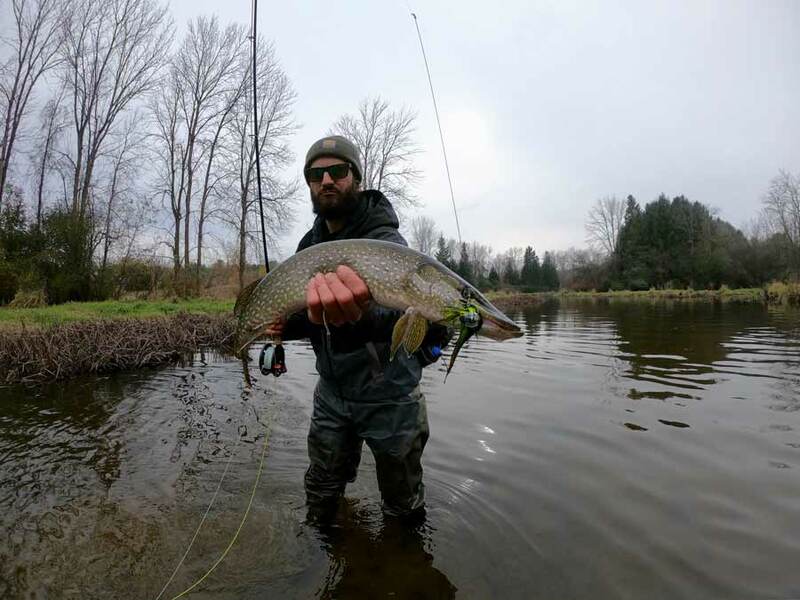 This fish came to Ed’s streamer three times before it finally struck. The best part about chasing northerns is how aggressive they are. They are ambush predators, so they seek dark, weedy, slow, water to sit motionless until prey swims or floats by. With remarkable speed, they shoot forward, ambushing their prey and making for one of the more exciting strikes I have experienced. 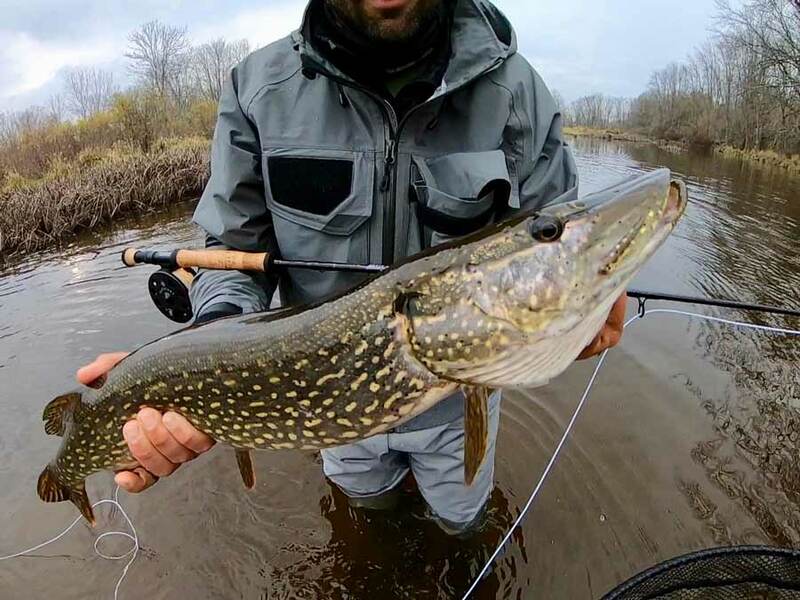 John drifted a white Lynch’s Double D Streamer under a river birch to tempt this pike. Another tip I learned was to “be greedy” on your casts: send your streamer as close to the shore, downed tree, under the bush, into the dark hole of the stream as possible. That’s where you’re going to get the pike’s attention. You must watch out for those teeth when you’re removing a hook. Also, don’t worry about landing your fly softly. Having it hit the water with a splat! followed by a quick strip can be all you need to trigger a strike. Now, if you get the pike’s attention and miss the strike, don’t panic. A lot of the time, these fish will swim a bit downstream and wait for their wounded prey to float down to them. Continue to work your streamer slowly, as you move downstream and you could quite possibly get back on that fish. Another river torpedo goes back to fight another day. 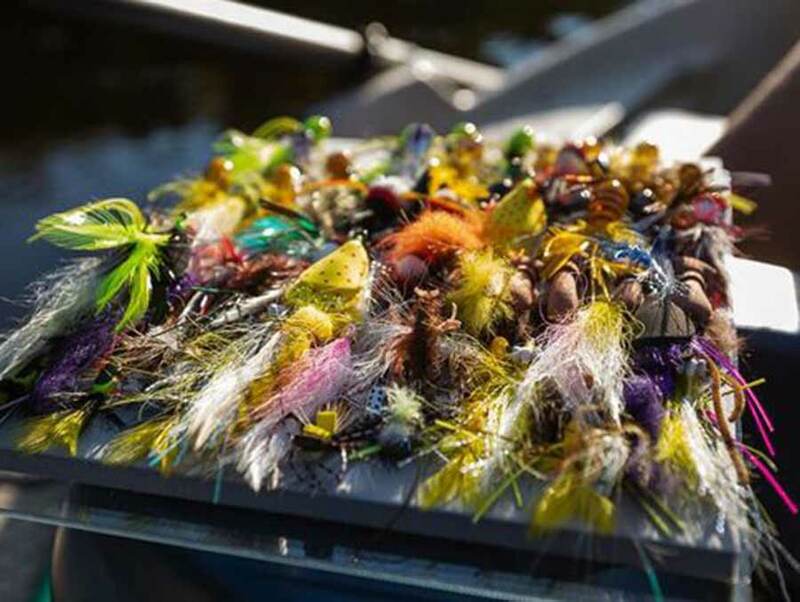 Chuck Coolidge lives in Phoenix, Arizona, and travels a lot to feed his fly-fishing passion.